I arrived home from The 2012 Erma Bombeck Writers’ Workshop in Dayton, Ohio a little wiser, a little happier, and a little jigglier after spending four days surrounded by humor writers who fed me nonstop knowledge, jokes and chocolate cake. 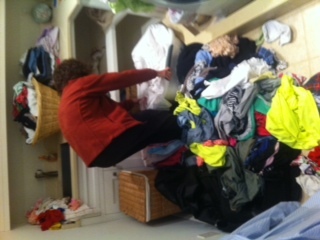 My family on the other hand, based on the state of our laundry room when I returned, spent the time I was away wearing every article of clothing they owned. It wasn’t just the dirty laundry that had piled up. So had 17 unchecked messages on the home answering machine. “Did you check the answering machine at all while I was gone?” I asked my husband, Chris. The house had not in fact burned down, but the food supply had diminished to wartime rations. The last time our refrigerator had looked that empty was the day it was delivered from Sears. A few shriveled potatoes were the only remaining vegetables in the house, and they had more eyes on them than Kendra Wilkinson poolside in Las Vegas. “When was the last time you ate a home cooked meal?” I asked Elizabeth while I searched the cupboard for food, finding a lonely package of bread containing two heels, and a half eaten apple. “I don’t remember. We ate out every meal while you were gone,” she said. It will take some undoing and some catching up, but eventually I’ll whittle down the pile of laundry, fill the bare fridge with food, and reschedule my husband’s missed appointments. After some regular exercise I may even whittle down my jiggle. For me, what grew out of the conference was more than what meets the eye—and I’m not talking potatoes. I, too, returned from the Erma Bombeck workshop to a pile of laundry and, my favorite part, a pile of mail. It was piled on the counter the way our dog sitter piles our mail when we are out of town. Well worth the return to a messy house, though. You’re right, it was definitely worth returning to messages, mail and mess. And yes, the cakes were a bonus! How sad that I haven’t heard one person rave about the Friday night fish (stark white fish bathed in a translucent white sauce is usually such a hit, no? ).Stack of mail on the counter? Check. Laundry piled near the washer? Check. And, oh – I live alone . . . .
Don’t reminds me about the fish! Not even the chocolate cake could right the Tilapia! Good luck catching up! Ah, men. Next time leave disposable clothing and coupons for pizza delivery. Now Husband pretends he is answering the phone. If I am in the shower and I hear it ring, I will yell “PICK UP THE PNONE!! !” He will pick it up. Then, without saying a word, he will carry it into the bathroom and hand it to me in the shower. Hey, welcome back! Handing you the phone in the shower–too funny. I say next time he does that, pull him into the shower with you fully clothed. So funny, and so true! My daughter said this morning, “Mom, I don’t think Dad knows how to cook anything. We either ate out or had sandwiches. I thought he’d at least fix hot dogs.” So glad we met, and I’m looking forward to reading more of your work! Well I suppose we should just be grateful that our kids got fed and that they weren’t forced to hunt and gather. Great to meet you Michelle. I look forward to staying in touch. Yes I suppose everything comes at a price. . .
Great post! I’m sure the conference was well worth it, and that you’ll get everything straightened out at home. Thanks! Thanks. And yes, it was worth alone hearing Adriana Trigiani speak! I hope the writer’s workshop recharged your batteries. You certainly returned to great material for another amusing blog. Welcome back, Lisa. It charged my “creativity” batteries. Schmoozing with conference goers for four days straight was exhausting, bit I came home inspired and that’s what it’s all about. Thanks for your kinds words, Judy. Erma Bombeck’s writing has always inspired me. The workshop sounds great – can anyone go to that? I love the part about the voice mail. I call my husband to tell him I’ll be late coming hom from work, get home and have to take my own message off the machine because he can’t seem to notice that the little light is lit up. You think he might miss me and be wondering where I am? No, he’s still waiting for me to call. I can totally relate! Deleting our own messages–you should write a blog about that! Yes, anybody can go to the conference. I highly recommend it. It’s every two years, and this year sold out in one day! Great picture! My husband is actually the Felix Unger of the house but in an unfortunate turn of events, he morphed into me and my house too was a mess. I’m so glad I got to meet you in person! I was sorry to have to leave after the tree-planting on Saturday. Oh ya, I totally missed the cake with every meal when I got home. It’s the little things..
Maybe when Oscar morphs back into Felix he’ll bake you a cake. . .
Oh no, two Oscars is dangerous. I hope he goes back to Felix soon. I really enjoyed meeting you, Terri. You are so easygoing and nice to hang out with. I look forward to keeping in touch. I told my daughter that I had 2 pieces of carrot cake and skipped dinner one night and she about flipped! She’s going to try to come with me in 2014. I hope they have an age minimum!! Loved the article and your pile of laundry. Miss you! Great, if she’s as charming as you are I’ll get two for one! It was so much fun hanging out with you, Stacey! I miss you too! So funny! Hope you’ve made your way through the laundry/phone/fridge aftermath. It’s nice to see that the Laundry Fairy skips your home too when you’re out of town — I always thought she had it in just for me. I’ve just so enjoyed laughing along with your posts — Thanks for sharing! It helps to commiserate, doesn’t it? On another note, thank you for making my day by honoring me with the Kreativ Blogger award! (But the best gift of all is knowing that my blog made you smile! 🙂 ) Thanks again for thinking of me–I really appreciate it. That’s your laundry room? Sorry. For a minute there I thought you were digging through a dumpster at Goodwill. When my Little Woman walks through the door from travels, she finds a spotless house, food in the frig and a glass of freshly poured wine. I go all Ron 1000 on the house. I know Mr. Chris is great guy or you wouldn’t have married him, but leaving the house looking like you need to call FEMA is just wrong. No, it’s double wrooong! I’ll be sure to tell my husband he’s in need of some Ron1000 training! Lol! I always find it funny how much you realize you do when you are away and there is noone who will take over your work for you! If we only had our own Rosey’s, like Jane Jetson did . . . I am sure the conference was worth the pile of laundry waiting. Loved the post. It was even worth the flight delay and waiting six hours at the airport to come home! HA! Your household sounds like mine. Except with less chicken nuggets and more Doritos. As you know.